WHISKY TOKEN (WHY) is the first whisky token based on Ethereum. WHY combines the unlimited growth potential of a cryptocurrency with the security of the real whisky value. This prevents the currency from losing value. WHYTOKEN GmbH strives to actively involve the community. This enables maximum transparency in the composition of our high-end whiskey portfolio. In this context, we are planning various concepts for integrating the community into our business model. Active right of a proposal: Within our social media presence we offer the possibility to post individual proposals for whiskey bottles for the whiskey portfolio. We will carefully review all suggestions and acquire them in case of compatibility. Right of co-determination in voting: We will have regular votes on potential whiskey for the portfolio. This gives the community the opportunity to select the most promising bottle for inclusion in the portfolio from a pre-selection by WHYTOKEN GmbH. 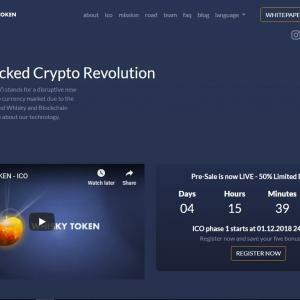 Exclusive preferential right in the event of disposals: If WHYTOKEN GmbH intends to sell whiskey bottles, the owners of WHISKY TOKEN are initially given the opportunity to purchase these bottles before they are offered on the secondary market.In contrast to other traditional assets, we are actively in contact with our community through social media. In this way, the WHYTOKEN GmbH combines full control of the portfolio with active co-determination by the community. As a result, we create maximum transparency with an innovative portfolio structure.